We tried in vain to get STONES tickets for their (1969) MADISON SQUARE GARDEN performance. Skipping school the day tickets went on sale, I took the next train after my Dad’s train so as to not be caught, to Brooklyn and then by subway to my cousin’s house off of Church Ave. When I arrived I asked my aunt not to say anything about me being there to my mom, her sister, when the next spoke. She just smiled. The box office was to open at 10AM, which it did and the shows were SOLD OUT in a manner of minutes. The remaining ticketless crowd, us included, became restless and angry. Not too happy, my cousin and I walked across Seventh Avenue toward the Blarney Rock to get a beer (phony ID worked since summer of 68 on Wall Street but no one asks for proof) when we were confronted by a drunken “hard hat” who harassed us about long hair. It’s only noon and this dude is loaded. Sorry dude, wrong day, wrong guys, now you will find out that long haired kids who are pissed can fight. Down he went. Screw him. John left him crying in the street before putting a cigarette out on the guys forehead, all in front of a small crowd who did absolutely nothing, no lie, they just watched. After a few beers in THE ROCK I was back on the train home before my folks knew I missed school. My aunt never told her sister. However, The Rock Gods must have found redemption as a few night later before going to the FILLMORE EAST for a Joe Cocker Show, I hit the Garden Box Office and obtained eight (8) tickets at 5 bucks each for a newly announced afternoon matinee show of… The Rolling Stones, Ike and Tina Turner and Terry Reid@ MADISON SQUARE GARDEN, November 28, 1969, the day after Thanksgiving at 2PM. Hallelujah, I’m in. Trouble seemed to pop up when I least expected it. Never having a curfew I was free to come and go as I pleased since I was 14 with one caveat, “Remember who you are, you carry our name”. In other words, “Don’t screw up”. One night, I had a slight verbal disagreement with my mom before going out with my friends to a house party. Mom was an obsessive cleaner and re-arranger of furniture. Me returning from the party about 2 AM, fully buzzed, quite intoxicated, and not knowing the kitchen table had been moved, bumped right into it, knocking over a chair with me falling to the floor. Lights on…Oh NOOOO. Mom was livid. She said Dad would deal with me. He came upstairs to my room, asking me if I was drinking, Yes I said, he said go to bed. That was it. Mom not satisfied the next morning with my light sentence announced….No shows for a while. WHAT? But THE STONES!!!!! “NO,” she said, “sell the tickets, you are not going”. So maybe The Rock Gods did not find me in good standing. Eight tickets, four for my cousin as promised with the four remaining for me. Geez, I was distraught. Dad said privately that I should give it a few days for it to blow over. YESSSS, I thought. “But”,he added….”But, what?”,I questioned. “You need to take your sister and brother with you”. But DAD? So my sister being all of 11 was going to see the Stones, my brother at 16 was ecstatic, my girlfriend was not happy as unbeknownst to me she had promised the other two tickets to “her” friends,WHAT? She didn’t even ask me, me the guy who bought the tickets.Yet life was still good, it’s The STONES man and I’m going . Oh yeah, I also had to cut my hair, short. Terry Reid (third time for me) was killer as an opening act. Ike and Tina’s Revue was tight but should have been called Tina Turner’s Revue, Then the point I had anticipated, light dimmed and JUMPIN’ JACK FLASH. The Best Album of 1969 even though it was released in December of 1968, BEGGAR’S BANQUET was my most played album of 1969. I got that record the moment it was released and it very rarely left my turntable for one full year. Side 1, Side 2, back to Side 1, and on and on. There are very few albums I can said that about, very few albums I listen to in its entirety without getting bored by a clunker or two. I was enamored by this collection of Stones tunes. The slick printed cover (American version which was completely different from the British cover), the photo spread inside, and the music. These songs were individually and collectively a great relief, a wonderful change in direction from the ROLLING STONES ’67 set of THEIR SATANIC MAJESTIES REQUEST, which I owned but never played all the way through. The only tunes I liked on TSMR were 2000 LIGHT YEARS FROM HOME and SHE’S A RAINBOW. The rest were rubbish. Track 3: DEAR DOCTOR, humorous to say the least..”Help me please Doctor I’m damaged”…“preserve it right there in that jar”. Sang this tune with like minded folks,we being very poor off keyed singers after a few cocktails. LET IT BLEED December 1969, I have it before Christmas and bought another copy to give my girlfriend as part of her Christmas gift package. SIDE ONE: Track 1; GIMME SHELTER, Merry Clayton, just a shout away. Charlie hitting the cymbals, harp playing. fade out, nicely done. Track 2: LOVE IN VAIN: another stolen tune, but one that everyone, including me plays.I saw FACES do this one night and after they finished Rod Stewart said, “I gave it a try but Mick owns it”. Track 3:COUNTRY HONK: Didn’t make sense until you put it in perspective of HONKY TONK WOMAN. I really like this tune. Thanks Graham, I know this was you. Track 4:LIVE WITH ME: Charlie lays it down, Bill bass lines are straight on, …“Don’t you think there is a place for you between the sheets”. What a great line but don’t try to use it. Bobby Keys nails this solo on sax, and I actually tried at the time of release to find out who this guy was. SIDE 2: Track 1:LET IT BLEED:”There will always be a space in my parking lot”…No longer is music “I Wanna Hold your hand” we are now in a dirty, filthy basement, yeah man. Track 2:MIDNIGHT RAMBLER: I had no idea what to make of this song, played it hundreds of times, trying to decipher what it was. THEN, I saw it live. My Lord. Now I knew. And about that moment I saw it live the ROLLING STONES became one of my all time favorite live bands. Track 3:YOU GOT THE SILVER:It’s KEITH, say no more.The future of THE STONES.Brian is in there somewhere, so they say, but I don’t hear him. Track 4:MONKEY MAN: A bit of Satantic Majesties kick off but then “all my friends are junkies” we are going down fast…I’m glad you are a monkey woman ,too”. Nicely, done.The guitars are intense. Track 5: YOU CAN’T ALWAYS GET WHAT YOU WANT: No words describe what I heard as a 17 year old male. The chorus, the horn, the acoustic guitar, Mick’s intro, “ but if you try sometimes, you might find you get what you need”….are they talking to me? It’s the STONES I played all of 1969, saw a few others bands, but 1969 was…THE STONES and I saw them. TICKETS TORN IN HALF:October 12,1970- ROCK RELICS AUCTION@Fillmore East This was a Rock RELICS Auction which was scheduled to have “Surprise Guests”.The Auction itself was a blast hosted by WNEW-FM Dj John Zacherle. A professional auctioneer monitored the bidding. Guitars, clothes, posters, drum heads, sticks, etc, etc were all auctioned off with the proceeds going to “candidates for peace”. Guest acts included Edgar Winter, Mongo Jerry, Elvin Bishop (with the Pointer Sisters) Jake and The Family Jewels, and David Rea.To this day I still have the program with all the prices the items sold for. It is said that probably more than any other underground paper, RAT newspaper was in the “eye of the political hurricane”. These guys made news as much as they reported it. Later on in college I attempted to adopt some of their concepts, i.e., ad layout, stealing other papers headlines and cartoons without copyright approval, etc. into what we were printing but that is another story. As it goes, RAT staff members were arrested in connection with a series of non-lethal bombings of corporate offices (banks) and military targets in late 1969. Money was needed for their defense as well as for the YOUNG LORDS, a group of Puerto Rican nationalists who RAT thought to be the newest, hippest of radical groups. 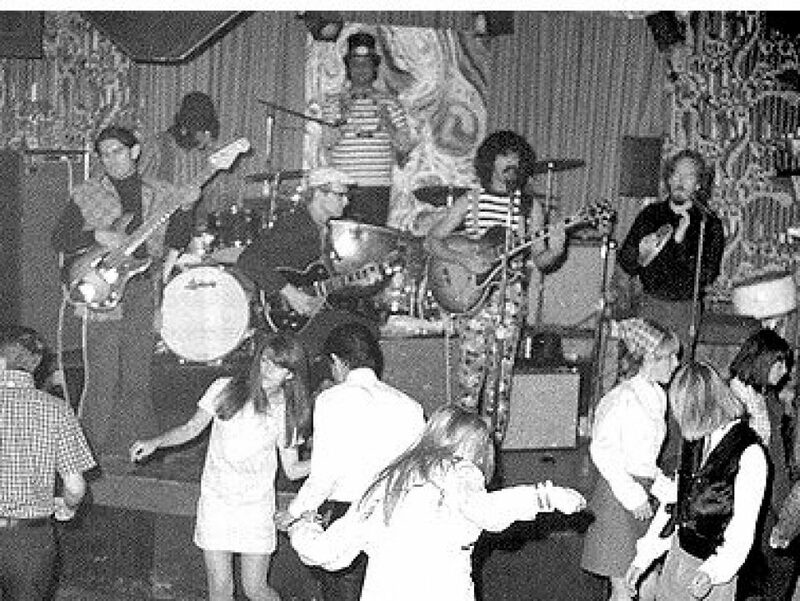 So, a benefit concert was set for The Hotel Diplomat Ballroom, November 15, 1969. Mostly everyone I knew was away for their “Senior Trip” to some upstate dude ranch. I was basically left alone for the weekend. The “CLASS OF 70” departed by bus Saturday upon the completion of a football game which was lost against our cross town rival. I attended a house party around the corner that evening. It was a zoo, and those in attendance mostly younger class mates were getting bombed. My buddy attended with me. After a bit of watching assholes make assholes of themselves, my buddy and I hit the road. Out in front of the kids house my friend took out his pipe and lit up a piece of hash. Little did we notice the police car sitting about a hundred yards away. He was probably responding to a call by a neighbor due to the excessive noise at the party. At first I was sure he didn’t see us until he started moving the car towards us. I threw the pipe over a nearby fence and lit up a cigarette. The officer came over, opened his window and said ,“You boys are smart to go home. This will get ugly later” and he laughed. I was so nervous my hands shook. We smiled nervously and I went directly home where I found my mother finishing painting my bedroom walls which I had started that morning. I went to bed early, thinking…Whew. So it’s now Sunday, my brother and I got up early and walked to the LIRR station to take the train into Brooklyn where we would meet up with my cousin.I was taking my brother to another rock n roll extravaganza as my cousin’s band was playing in a ballroom in Manhattan that evening. We arrived in Brooklyn in early afternoon and helped load the Ryder truck with equipment and a few cases of cold beer. When all was safely tucked in the truck we, the band, roadies, girlfriends and others got in the back of the truck and the door was slammed down shut. Away we go. Stuck in traffic for what seemed like an eternity, the lead guitarist a bit intoxicated had to pee. No escape, no hope, he just peed himself. This RnR lifestyle was not what I expected it to be. We hit our destination and searched for a place to buy him new pants, but BLUE LAWS (businesses closed on Sundays), limited our choices. Ultimately one of the girls found a pair of pants. Me, I found more beer. The night was fun to say the least. Allen Ginsberg was chanting and running around in a toga with bells on his fingers, the speeches were political rants filled with profanities, my cousin’s band was hot doing two sets, and VIVA, a Warhol actress took a liking to me, drinking some of my beer and followed me to the bathroom when I had to pee.Oh, and there were TV cameras and reporters scattered around the hall. It was very late or very early depending on how you look at things when my brother and I arrived home. Dad was seated in his usual chair at this ungodly hour with an ash tray filled with cigarette butts. I sensed this was not good, “Who died?” I thought. Dad while not taking his eyes off of me told my brother to go to bed. The INQUISITION began and lasted forever. Seems like the 10 O’Clock News, the one which asks the question every evening “DO YOU KNOW WHERE YOUR KIDS ARE?” had a feature tonight on RAT newspaper having a benefit for folks blowing up banks, Puerto Ricans Nationalists, no less. And we were the stars. Geez, he was so angry, oh, was he angry. He didn’t speak to me for days, he avoided me. Going nearly five weeks without a show was tough. While working out some personal difficulties with my folks (HOTEL DIPLOMAT) I was doing extremely well in school while meeting more and more new “friends” and still pulling full time hours in the cassette factory when I saw the VILLAGE VOICE ad: Joe Cocker November 22, 1969 at Fillmore East. The bill also included (Peter Green’s) Fleetwood Mac and King Crimson who recently got some radio play. So, why not? Great seats arrived. FLEETWOOD MAC, yes I will be back. I really don’t know if it makes any sense but I was willing to sit through ALL the other bands AND stay for Joe Cocker, for a few songs, just to see BUDDY GUY again. The man is a show unto himself and well worth the price of admission. Story goes: a woman at work takes the morning off, arrives early to get a numbered bracelet to wait in a second holding area to purchase tickets for some/all of the tickets available for the summer series at Jones Beach. I give her my cash and with specific instructions,”only buy me tickets if they are on the floor AND real, real close”. Bingo, I’m in. THE GALES BROTHERS opened in the late afternoon to a sparse crowd of about 300. What a shame as they were entertaining.The Fabulous Thunderbirds, this being 1996 many moons after Jimmie Vaughn and Duke Robillard, should rebrand as THE THUNDERBIRDS with KIM WILSON. THE RADIATORS are a funky, as in very funky, NEW ORLEANS ensemble that rocked the joint. The crowd was growing by the minute and with each song the applause got louder. The sun was going down as BUDDY GUY hit the stage and before he was done the place was standing and rockin’. Buddy made his venture out into the crowd and slipped pass me, an aisle seat about 14 rows back. He stopped, saw me nod, and played a few licks as if just for my enjoyment. WOW, he was great. “We’re going to make it so funky you can smell it,” the Chicago bluesman promised early on, standing in front of the logo of the tour’s sponsor, the House of Blues. Guy showed himself a master of extremes, unafraid to bring the volume of his lead-playing to a level that was barely audible before returning to his ecstatic, tortured leads. If his set’s pacing was sometimes jarring, and perhaps too generous with solos from band members, it was always redeemed by the playing. Guy strolled deep into the crowd, posed for a snapshot and found a seat, all while playing a euphoric succession of mournful, inspirational notes. TICKETS TORN IN HALF: AUGUST 29,1998: PETER GREEN’S SPLINTER GROUP @ TRAMPS. TICKETS TORN IN HALF: AUGUST 29,1998: PETER GREEN’S SPLINTER GROUP @ TRAMPS. Immediately after this show I wrote a review which was published in a general fanzine from New Jersey and another one in PETER GREEN’s fan club newsletter out of England. To paraphrase my lengthy heartfelt item: “I went with great trepidation knowing the history of PETER GREENBAUM during his FLEETWOOD MAC days and the subsequent mental illness issues which made him virtually and literally disappear from the music business for years. He, Peter is THEE MAN who founded what was first known as PETER GREEN’S FLEETWOOD MAC, yes, the entire name, his upfront, aka The star of the show, “a guitarist’s guitarist”. The first album blew me away. While mainly listening to TEN YEARS AFTER (their debut) at the time along with a few other “British blues” collections, the first PG’sFM album stunned me”. “ThoughtCo.” described the album as an ” inspired mix of blues covers”, and placed it in the top 10 “The Best Blues-Rock Albums Of The 1960s”. “Guitarist” (UK magazine) placed the album in “101 Essential Guitar Albums”, and John Tobler considered the album to be one of the “100 Great Albums of the 60s”. I scooped up FLEETWOOD MAC the summer of 1968. While looking to purchase CREAM’s “WHEELS OF FIRE”, the salesman in the record store told me “this is the guy who replaced CLAPTON in Mayall’s BLUESBREAKERS and he is so good”.A few weeks later I took his recommendation, purchased the item and never looked back. As a matter of fact, I also bought JOHN MAYALL’S “Hard Road” featuring Peter Green. The song “The Supernatural”, well, classic Green.November 22, 1969 I saw FLEETWOOD MAC live at FILLMORE EAST and he/they were better than advertised. Jaw dropping good. What a band, what a great guitarist. Then, before their scheduled 1970 show at FILLMORE EAST, Peter quit the band, his band, and started his “disappearing” act. Over the subsequent years I collected most everything I could regarding Peter Green, especially his/ their live stuff (mostly bootlegs): Mayall’s BluesBreaketrs, Fleetwood Mac in Boston, jamming with The Dead and Duane Allman at Fillmore East, etc. Forty plus pieces of sheer joy. So here I am in TRAMPS on a hot August night in New York City 1998, twenty-nine years hence, not knowing what to expect. This small but quaint venue is sparsely populated tonight,plenty of elbow room so I am stationed upfront when the lights dim. “Peter Green’s Splinter Group” is the announcement to light applause.Peter looks, well noting like Peter Green of old, in fact, he looked old and very nervous. The band kicks in and Peter plays a few notes, mostly rhythm guitar, at best, and his guitar is obviously turned down real low. He doesn’t truly sing either as the other guitarist did most of the lead playing and singing.I was crushed. A few songs in,”It Takes Time”, “Homework”, and then “Black Magic Woman”, finally Peter arrived,somewhat. The sweetness could be heard coming out of his amp. He looked as if he was concentrating so hard to play the notes, but he nailed it, for me anyway. My buddy hated it. “Albatross”,”The Supernatural”, ”The Green Manalishi”, oh my, the line in Manalishi rang true “making me see things I didn’t want to see”, his playing was tentative but worth every second. I made it back one more time to see Peter Green in September of 2000 at B.B. King’s in New York, John Mayall’s Blues Breakers and Peter Green’s SPLINTER GROUP. Peter was so much better this time, more relaxed, and did an acoustic set of tunes. After the show Peter signed our ticket stubs and spoke to us about (true) The NY FOOTBALL GIANTS. Yes, he did. Recently, I saw a documentary about Peter Green and his struggles with mental illness. His medications seem to be under control and he is articulate, humorous, and willing to speak about the band, his music and his life. God bless him. He still has a strong distaste for the “music business”. IT’S BEAUTY THAT KILLED THE BEAST: It’s a week before those “3 Days of Arts, Music and Fun” aka WOODSTOCK that Fillmore East hosts Jefferson Airplane and Joe Cocker., both acts which would be stars on stage and later screen. SPONTANEOUS SOUND, a one man percussionist (if that’s what he was) ran amok on the stage, banging, hitting cymbals, drums, bells, the works, with long hair flowing and with no shirt; What an idiot, I thought. After his fifteen minutes of fame was over I was both confused and amused. Joe Cocker was up next and having had his first LP on heavy rotation in my room, Cocker turned out to be not what I expected at all. He was a visual experience, hands gesturing as he sings, yet this British white dude sounded like Ray Charles. Familiar cover songs he introduced were played and each seemed to take on a new persona, they became Joe Cocker tunes: LET’S GO GET STONED, FELLIN’ ALRIGHT, BYE BYE BLACKBIRD and of course WITH A LITTLE HELP FROM MY FRIENDS. The AIRPLANE was a trip, really a trip. I had been waiting a long time to see these guys, since that NEWSWEEK article and that conversation with my neighbor many months ago and now here I was. As the final scene from the King Kong movie played behind the band, they tuned up and “It wasn’t the airplane, it was beauty that killed the beast” and away we went with Ballad of You, Me and PoohNeil with The Glenn Mc Kay Headlights behind the band projecting images on the screen.The amps cranked up really loudly, three vocalists, a bass player who stalked around, a drummer who with his cowboy hat looked like a sheriff and a guitarist making the strangest feedback. Was I high or where they THAT good? They were that good.